Each physical therapy session is highly individualized and will include the techniques that are most appropriate and beneficial to you. Your treatments will progress as you move towards a stronger, healthier, better you. A gentle, safe, hands-on approach to relieving tension, pain, and dysfunction throughout the body. This approach targets the fascial system which is a tough connective tissue that spreads throughout your body from head to toe (much like a three dimensional spider web). When this fascia is damaged through trauma or inflammation it binds down and can put pressure on muscles, nerves, organs, blood vessels and bones. Myofascial Release is one of the most effective forms of bodywork available today. For more information about this specialized form of therapy, please visit the JFB Myofascial Release Website. Due to the personal nature of these types of issues or the lack of knowledge about treatment options many times people suffer in silence. Despite the fact that pelvic floor issues are highly common, they are rarely discussed and undertreated. Not only is myofascial release a highly effective treatment for pelvic floor issues, often times the fascial restriction within the pelvic floor are connected to and affect issues in other areas of the body such as headaches, low back, neck, or jaw pain. There are many Myofascial Release techniques that treat restrictions that occur within the mouth due to things such stress (clenching/grinding), dental procedures, or trauma. If you are looking for a treatment option for TMJ, jaw pain, gum pain, headaches (see common diagnoses for a full list) look no further, Myofascial release is for you. A functional and dynamic therapeutic exercise program will be developed to address your unique needs. 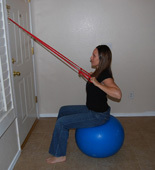 A strong emphasis will be placed on myofascial stretching, rebounding and unwinding. Your exercise program may consist of body awareness, diaphragmatic breathing, therapeutic exercise, postural awareness, neuromuscular re-education, therapeutic activities, and/or gait training. This program will be designed to address your body as a whole, your function within the environment(s) that you live, and your desired activities for life. You will take responsibility in your recovery through a home exercise program specifically tailored to you and your goals.